At the beginning of this decade, Fort Smith, Arkansas was at a crossroads. The city has a history to be proud of. Situated at a scenic bend on the Arkansas River, which threads its way through a narrow valley between the Ozark and Ouachita Mountains en route to the Mississippi, the city was a natural stop on western expansion routes to Oklahoma and Texas. Because of this, Fort Smith flourished in the late 19th century and the early 20th. It had arts venues, hotels, industry, and a remarkably diverse population. Recent history, however, has been less kind to Fort Smith. The city grew by fewer than 6,000 people from 2000 to 2010, while losing thousands of jobs. And downtown was a shell of its former self, having gone the way of many American downtowns in the late 20th century. Depopulation and a loss of economic activity led to empty sidewalks and vacant buildings, historic structures gave way to parking lots, and human-scaled streets to wide stroads, inhospitable to foot traffic. In 2012, when Fort Smith set out to update its comprehensive plan, the city also found itself in the midst of tough public discussions about where public resources should best be spent. On the one hand, the annexation of the decommissioned Fort Chaffee through the military's BRAC (Base Realignment and Closure) program led to ambitious plans to create a new community out of whole cloth on the site on the eastern outskirts of Fort Smith. On the other, downtown Fort Smith had existing investments in its favor: all the public infrastructure necessary to support a lively and productive place. What it didn't have was enough people to make it one. The city's new comprehensive plan, entitled Future Fort Smith, was completed in December 2014, but the vision it laid out, careful not to pit one part of the city against others, was light on details for downtown specifically. Public feedback in the planning process had clearly indicated in that many citizens wanted a more vibrant and walkable downtown, one which made the riverfront more accessible and treated it as a real asset. But the Future Fort Smith plan alone did not provide enough guidance as to how to implement this vision. 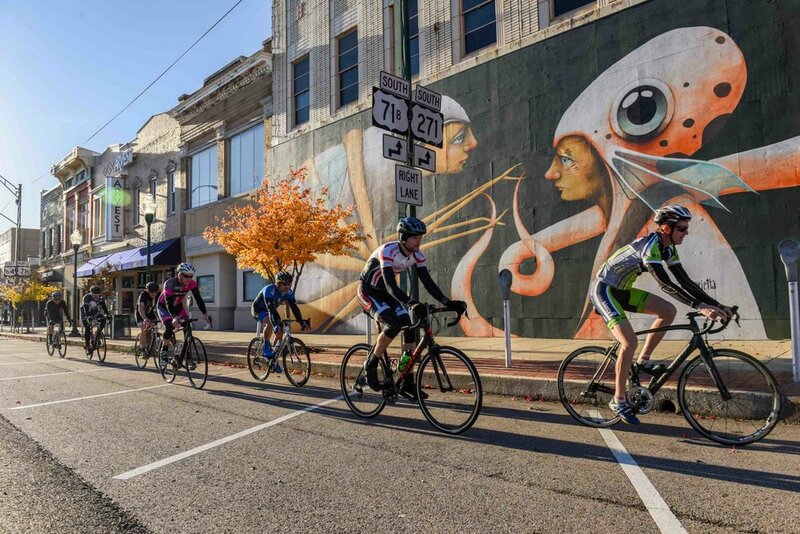 Since then, a nonprofit placemaking organization, 64.6 Downtown, has done a remarkable job of bringing new life and momentum back to downtown Fort Smith, and working with the city to spell out a detailed, affirmative vision for what downtown could be. It's an illustration of the immense power of a grassroots approach. In addition, 64.6's successes are an inspiring example of what is possible when you look at a place holistically and bring together all of the people and organizations with a stake in what it could be, instead of letting each group—the local government, business interests, housing advocates, arts institutions, and so forth—operate in its own silo and fixate on its own area of expertise. "So... What Exactly Do You Do?" I spoke with 64.6 Downtown Executive Director Talicia Richardson about her organization's history and current efforts. Richardson was hired in June 2018 as the organization's head, but she had long been involved with 64.6's efforts and in the community more broadly, having served on the Fort Smith Planning Commission and more recently the School Board, and having worked as the development officer for the Fort Smith Housing Authority. Richardson and her husband were drawn to downtown when they moved back to Fort Smith after years away. "I've lived in big cities like Dallas, Austin, Atlanta, Phoenix, and smaller cities like Joplin, Missouri and Fort Smith," she told me. "Our conversations here [about downtown placemaking and revitalization] were just starting, while other cities were at the execution phase." During this time, Richardson credits Strong Towns with being "a great model to see we were not alone." Indeed, a Strong Towns approach is evident in the way Richardson talks about her work and that of 64.6 Downtown. These efforts are bottom-up, collaborative, and open to happy accidents, experimentation, and evolution. 64.6 (the name represents the number of square miles within city limits) was founded in 2015 by local businessman Steve Clark. Its goal was to serve as a catalyst for economic development by fostering arts and culture in downtown Fort Smith. People want to enjoy themselves and to experience novel and exciting things, says Richardson. Giving them those opportunities could help turn downtown back into a destination. 64.6's first major project, in September 2015, was an installation of murals called The Unexpected. Since then, it has evolved into a full-fledged urban art event: this year's installation will take place October 22-28, 2018. In 2017, The Unexpected won the Henry Award for Community Tourism Development, and thanks to the event, Fort Smith was recognized by Arkansas Business as a "Trendsetter City" in tourism. Steve Clark and 64.6's early team didn't anticipate the organization would evolve so quickly. 64.6 has become involved in an impressive range of activities beyond public art. The organization has fostered public spaces where arts and events programming can occur: it has created Garrison Commons, downtown Fort Smith's only pocket park, and more recently Gateway Park, a privately funded project that 64.6 will own and develop and then partner with the city to maintain. The organization also plans to renovate the New Theatre, a 1911 Beaux Arts building. The group's website provides an even broader sense of its mission—menus at the top spotlight residential and commercial properties for sale or lease, parks, placemaking, art and events. Given this ecumenical approach, I was having a hard time concisely answering the question, "So what does 64.6 do?" I asked Richardson this question. Fundamentally, she said, the power of a group like 64.6 is in its ability to act as a convener. 64.6 does not manage the riverfront park, for example, but because of the organization’s influence and social media following, people planning events there come to 64.6 to collaborate. While the nonprofit doesn’t actually have real estate holdings in commercial or residential space, it can help promote and market those of other downtown partners. 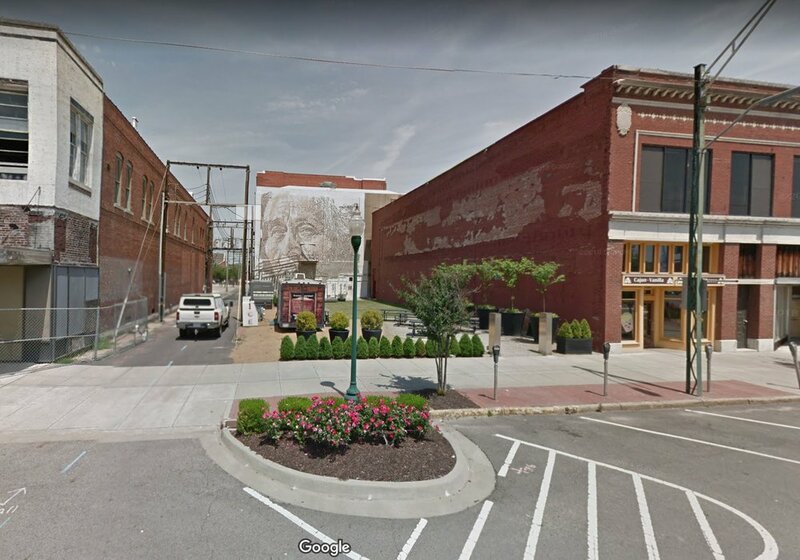 64.6 has helped educate private property owners on the possibilities for historic renovation using available tax credits (to include providing general information on the new Opportunity Zones program, since downtown Fort Smith is one of the designated zones). 64.6 has also been a leading advocate for public space and walkability downtown. It has talked with Fort Smith police about monitoring safety conditions on sidewalks, and with public works about examining and improving the timing of pedestrian crossings at intersections. It has engaged with the state Department of Transportation as well as with the city. Thanks in part to the group's advocacy led by the Metropolitan Planning Organization, when active communities expert Mark Fenton came to town in April 2018 and did a walking audit, the state’s transportation official for the region was in the room, hearing from an expert about the need for traffic calming and better conditions for people on foot in Fort Smith and neighboring community Van Buren. “We can't say it was because of The Unexpected, but we know that The Unexpected, Peacemaker Music Fest, Steel Horse motorcycle rally, and other downtown events drew people to our region. We can’t take full credit, and we’re okay with that. But over the years, there have been groups that have come in and executed quality events that are truly growing a following. Rats 2 Riches, a ratrod car show, is moving their event from one location in our city to our downtown convention center. And we’re trying to cross-market that as well. It is because of this trust that 64.6 is now playing an integral role in implementing Fort Smith's Propelling Downtown Forward Master Plan. Rather than being driven by City Hall, this plan was spearheaded in 2016 as a public-private partnership. It sought to use the Future Fort Smith comprehensive plan as a springboard to develop more specific, implementable goals for downtown. It was adopted into the city's comprehensive plan in 2017 with the goals of “creating sustainable downtown growth with attainable housing, increased residential and commercial spaces, walkability, bikeability and overall increased entertainment and cultural amenities,” a 64.6 Downtown news release explains. Richardson was part of the initial team that recruited the consultant (Dallas-based Gateway Planning) and put together more than $250,000 in private funding. In 2017, when there was still no director to shepherd the plan to implementation, the board of 64.6 asked Richardson if she would be interested in the position. "The $258,000 plan authored by... Gateway Planning had been 'collecting dust,' according to former CBID chairman Richard Griffin, and would likely continue to do so if it didn’t have a full-time administrator to speak up for downtown interests at the local and state levels." Richardson said, “My role is to drive the components that have been clearly outlined in the Propelling Downtown Forward plan.” These include better leveraging the riverfront as a destination, including through the opening of a new skate and bike park next to the existing US Marshals Museum, and trying to bring more programming to the riverfront amphitheater. Richardson would also like to see more diverse housing downtown. There is low vacancy among the units currently on the market, she said, which is evidence of unmet demand. She hopes that downtown's marketing as a destination can continue to improve. The Chamber of Commerce serves the region of Fort Smith and businesses at multiple levels. But right now, there is no downtown-centric one-stop shop online for information about opportunities downtown. "If someone is looking to relocate, or move their business, or start a business downtown, we want to establish an avenue to communicate to them," she said. Downtown Fort Smith also needs to diversify the audience for its public events. "There are a lot of people on the north side who don't know what's going on here downtown." A jazz night in the pocket park was one example Richardson gave me of a recent effort to draw a more diverse demographic to downtown Fort Smith. Ultimately, says Richardson, "I want people to know that Fort Smith is development ready. We are engaged. We're eager. We're not perfect, but we're always working on it." In this episode of our podcast It’s the Little Things, Jacob chats with Caroline Dobbins-Hurteau—staff member at Albion Reinvestment Corporation—about how you can start a successful pop-up shop, including how to pitch the idea to downtown organizations, how to find prospective tenants, and, most important, how to make it an incremental yet lasting success in your city or town. 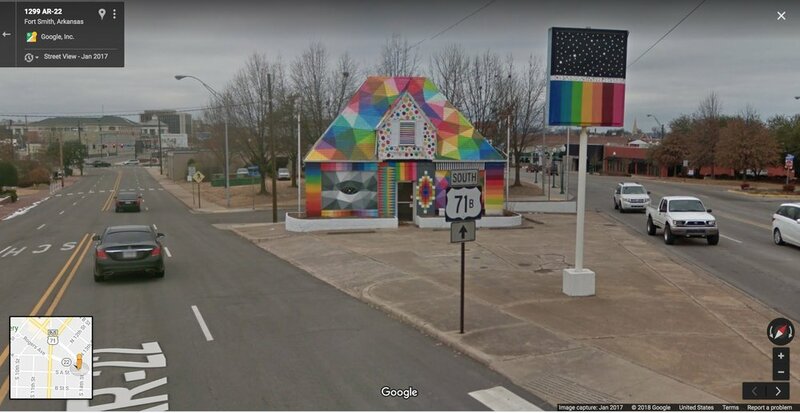 How one city made a grave mistake when it let itself be defined as a place people pass through, or one they leave every morning to go somewhere else. And how it could start to undo that mistake.